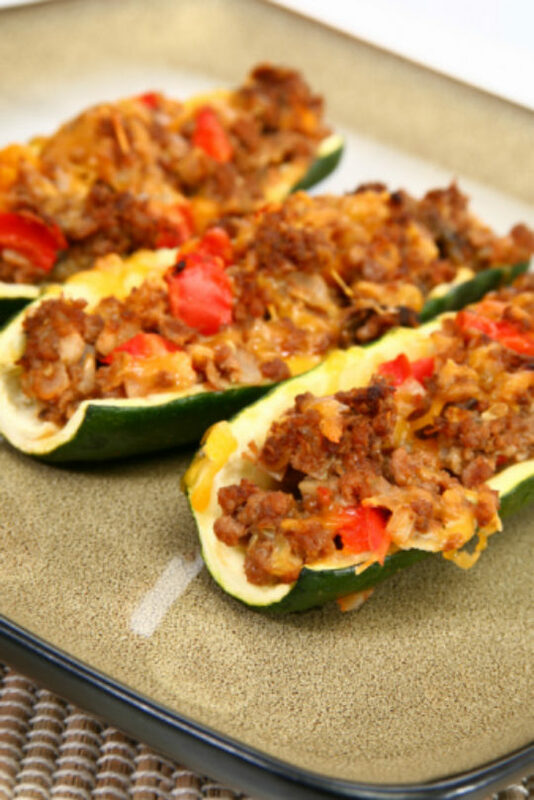 These veggie-stuffed boats make a great summer dish and are made with cornbread stuffing, shredded carrots, onion and low-fat cheese. They are also wonderful paired with any meat. Halve zucchini lengthwise. Scoop out pulp, leaving ¼-inch thick shells. Discard pulp. Place zucchini halves, cut side down, in a large skillet. Add ½ cup water. Bring to a boil; reduce heat. Cover and simmer for 5 minutes. Drain zucchini on paper towels. Meanwhile, prepare stuffing. Lightly spray a medium saucepan with vegetable spray. Add carrot and onion; cook over medium heat until onion is tender. Stir in stuffing mix and water. Spoon stuffing into prepared zucchini, then sprinkle cheese on top; place them in shallow baking dish. Bake in 350° oven about 20 minutes, or until zucchini are tender and stuffing is heated through.